Record data from tissue bath, isolated organ, Ussing chamber and field stimulation experiments. Record data from tissue baths, isolated organs, Ussing chambers and micro-electrode recordings. AcqKnowledge® provides a range of tools and automated analysis routines for many laboratory applications. Predefine event marks for dosing regimens and experimental protocols, control devices such as syringe pumps and ventilators based on the physiological data. Stimulate tissue preparations, nerves and pace a heart or ventilator. AcqKnowledge® provides options for display, analysis, control and stimulation. Record and analyze tissue bath preparations. Force transducers work down to the milligram range and will record responses from small aortic rings to much larger preparations. 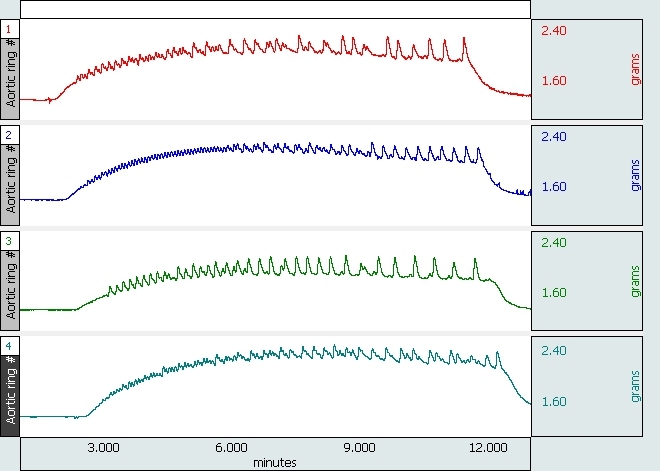 Automatically analyze pulsatile tissue data with the online calculation channels. The calculations will provide real-time values for maximum, minimum, peakto-peak and the area under the curve for each response. Automatically analyze peak response to a drug & enter measurement results into the Journal for further analysis. Record absolute peak response or the mean peak response over a user-defined time period. Record and analyze tissue bath data from preparations such as aortic rings and ileum. The AcqKnowledge® Event marking system can be preconfigured to match the experimental protocol allowing markers to be entered at the appropriate points in time. The software can identify the event marks and automatically take measurements at those points. The display allows you to simultaneously view both the trend and zoomed data. It is even possible to pause the display and compare earlier responses to the current data. A fully automated analysis routine provides a cycle-by-cycle analysis of the MAP signal. The software scores the waveform to identify the appropriate points of the signal, measures the data, plots the results and exports them to a spreadsheet. The software will report values for: 100% recovery period, dv/dt max/min, end diastolic voltage, maximum and minimum voltage, BPM, stroke amplitude and a user defined recovery period. AcqKnowledge® includes automated analysis routines for blood pressure and left ventricular pressure and will display the results as new channels along with exporting them to a spreadsheet for further analysis. 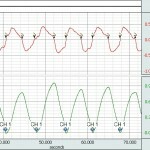 Calculate tidal volume, airway resistance, and dynamic compliance and also monitor temperature, pressure, pH, and pO2. Automatically control a ventilator to start and stop during an experiment. A fully automated analysis routine will provide a breath-by-breath analysis including peak inspiratory, peak expiratory, tidal volume, minute volume, BPM, inspiration time, expiration time, total breath time, apnea time, resistance and dynamic compliance. The software will provide real-time analysis of the signal including, max, min, peak-to-peak and area under the curve. Create focus areas around the dosing periods and the software will automatically analyze the data around them and export the results to a spreadsheet. The Neurophysiology analysis suite includes a number of tools for the identification of spikes within extracellular data. The software will identify the spike using a fixed threshold crossing method using a user defined multiple of the standard deviation to the mean signal. The data is scored by placing event marks that identify the onset and offset of the spike. 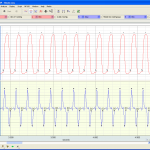 The software provides options for histogramming the data based on spike amplitude or dwell time. A spike train generation utility identifies when action potentials are firing. The spike events are also used to synchronize averaging of the average action potential. A spike classification feature uses a K-means clustering algorithm to group the spikes into unique classes for sorting. There is also a tool for identifying overlapping spike episodes. AcqKnowledge® includes stimulation control software that interfaces with BIOPAC’s range of constant current and constant voltage stimulators. The software can delivery square, ramp, sine and arbitrary waveforms for a wide range of stimulus paradigms. Use ion-specific electrodes to monitor the change in a preparation’s ion concentration. To determine ionic activity, use the Equation Generator in AcqKnowledge® to implement the Nernst equation.